This is a modern novel set, like so many others, in a dystopian, post-apocalyptic world. It is inhabited by a large cast, both human and non-human. However, Lifel1k3 is not about analysing the causes of wars and other violence or even about how people survive these. This novel is about questions of identity, memory, being/not being; and relationship – to one’s self, to others and the past, present and future. Jay Kristoff is a philosopher and the saga he takes the reader through is a background to the deep questions he poses, through the voices and thoughts of the characters. I consider myself to be non-judgemental when it comes to how other people want to self-identify and live their lives. However, I found myself confronted by some of the questions that revealed themselves as the saga unfolded, and certainly challenged by all of them. Very little in the early part of the novel prepares the reader for the surprises that seem to come out of nowhere later on, sometimes shockingly. Jay Kristoff is masterful in this, because the reader is so caught up in the thrilling action and the struggles of the characters – physical, emotional and mental – that the unexpected is like a blow to the base of the skull or to the solar plexus. These surprises sometimes left me breathless. The really great writers of ‘other-worldly’ science fiction – such as Isaac Asimov and Frank Herbert – are able to create canvasses that are just recognisable enough for the readers to visualise themselves inhabiting them. The magic wrought by these writers is to then people them with recognisable beings who behave in unusual, perhaps disturbing, ways. It is the technique used by some film-makers when they isolate a handful of people in a place that becomes a pressure cooker. We then watch some of them start to behave in strange, disturbing ways. 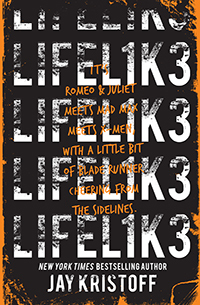 In Lifel1k3, Jay Kristoff asks readers to dig even deeper; to look at themselves in a mirror and dare to ask what they would normally shy away from asking: what is it that defines me as human? We have a fascination with AI and play games against computers, thrilled if they are good enough to beat world (human) champions of chess or Go. We are at a point where it is becoming increasingly difficult to be sure if the voice at the other end of a phone line is human or computer-generated. If you were introduced to a stranger and interacted with them as you would with any other person and then were told that this was an android, what would be your reaction? Could you fall in love with an android? The ‘main’ character in Lifel1k3 does so and she has strong emotional attachments to a small robot and a flesh-and-metal cybernetic dog. Does the dog really love her or is he programmed to? If ‘machines’ are made to have, or at least able to simulate, human-like traits, would you be fooled? Would you accept them as part-human? Do you talk to your robot vacuum cleaner? Some people do. Although Lifel1k3 is set in the future – how far is not clear – the questions raised about our relationship with creatures that are not Homo sapiens has most of us engaged right now. And, although the book is ostensibly about how humanity might go too far and all but wipe itself out, along with the biosphere, it is also very much about the lifelike entities we are creating and how we are to live with them in our midst; or live ourselves in their midst. The publisher has pitched the book at fourteen- to eighteen-year-olds, but the questions posed should be considered by all adults, because we are creating their world.